Pablo Fiasco exhibition at the Sptiz Gallery, opens with a private view this Friday May 11 from 7 pm. Below is some information from The Spitz Gallery website about Pablo and his work. 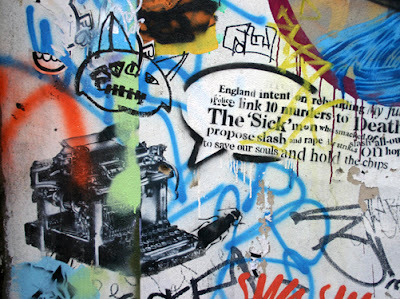 Pablo Fiasco is a canadian/english performer, designer and stencil graffiti artist living in london. For over 12 years he has been leaving his cryptic graffiti messages in cities around the world. His work is both modernist and ambivalent, creating a concrete poetry that the viewers must piece together as they wander the streets. His beautiful and highly detailed stencils include the widely recognised typewriter which represents a linchpin for his vocabulary - urgent but broken transmissions that work as pictures or poems. His form involves placing beautiful objects in unlikely places, and his iconography is eerily evocative and rarely direct. For him this covert communication is a form of a comic strip for the streets, where little is clear and nothing is spelled out. His symbology has the traits of other forms of graffiti: where letters become pictures, and these word pictures and patterns suggest a struggle against simple meanings. He also samples and collages images from pop culture - our collective unconscious. His advertisements feature frankensteins and aliens - the myths and monsters of our cinematic and televisual continuum have been apprehended and retransmitted to communicate a message of apprehension. His work is a chaotic messaging pattern asserting itself cartoon - like, within the great choatic messaging pattern.